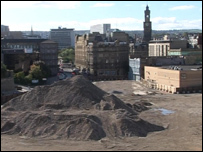 Shoppers in Bradford who were expecting a new complex in the city centre could have to wait another three years before the project is completed. Developers Westfield - who are behind the Broadway Shopping Centre - are waiting for high street stores to sign up before starting the building work. The company has already put £50m into the Forster Square project and has pledged the complex will be built. But councillors are now asking how long it will be before the scheme starts. A year after the demolition work got under way there are now no workmen at the site and no heavy machinery, just piles of rubble from the buildings which had been cleared to make way for the new development. What would be the alternative that is on offer? Simon Holberton, Westfield's European Director said "I would continue to ask the people of Bradford for their understanding, we are going to build this shopping centre, we are totally committed. "We have already invested more than £50m. "We are not going to walk away, we are going to build it, but these things take time." But Bradford councillor David Ward is concerned about what the future holds for the site. "What would happen if the major companies did not sign up?," he said. "Of course we hope that they do, we still hope that they do now. "But what would happen if they didn't and what would be the alternative that is on offer?" Westfield say the prospect of the finished centre - which would bring jobs and money to Bradford - is about three years away.